A blessed Lent to all! May the good God aid you in every way as you take up battle against spiritual evil. I wish to take this holy time to make known something I feel deep in my heart – everything to JESUS, through Mary, with Peter! This is a refrain, an invocation, that was given by St. Josemaria Escriva. 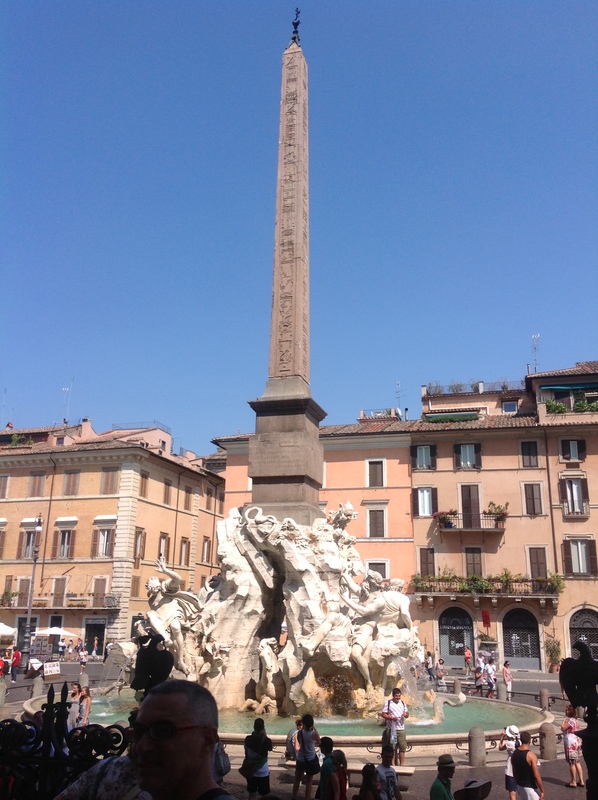 It is one I have always used but since I have come to Rome I have understood it better than ever. These are hard times in the life of the Church. Many waves crash against the barque of Peter and the Faith wains in many parts of the world. When we hear the words of Jesus from the Gospel, “But, when the Son of Man comes, will He find Faith on the earth?” (Luke 18:8) it is easy to tempted to dark thoughts and worries as trends hostile to the Faith spring up every where. How did the world come to encounter Jesus? Through Mary. Not because of Mary – it was because God so love the world. The Blessed Trinity is the reason, the cause and the end of all of this joy. But the Blessed Trinity came to us through Mary. When the world saw the face of Jesus Christ it saw the Face of God. Jesus is the image of the invisible God. He was seen with eyes and touched with hands and heard with ears and so forth. 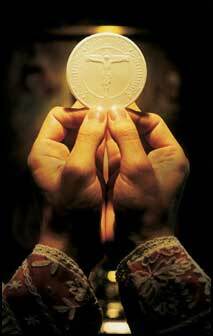 Thus does He leave the Sacraments and thus did He leave His image. He also left her image. The image of Jesus at Manopello is a miracle. The image of the Virgin Mary at Monte Mario is not. Jesus is God. Mary is not. But Jesus and Mary are inseparably linked – His humanity comes from her humanity. Her desire is His desire, “Do whatever He tells you.” Devotion to her will lead you only to love Him more and more and more. The image of our Lady, which I have posted above, is the mother of all icons, of all images of Mary throughout history (except Guadalupe, which I will write about another time.) This image was lost to the world for many years. And that was ok – the world didn’t need it in order to live and love Faith. In these days the image, through amazing workings of Providence, is known again. 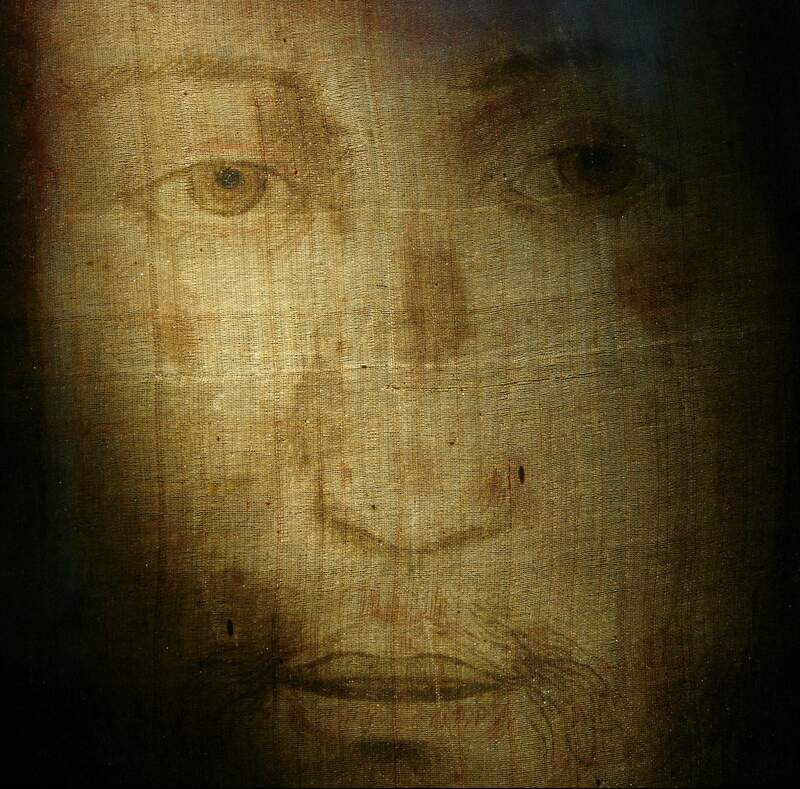 As Pope Benedict XVI went to see the Face of Jesus at Manopello, he also went to see the face of Mary on Monte Mario (to Jesus, though Mary, with Peter.) I have no doubt that these images will be at the center of the New Evangelization. To contemplate them is to contemplate the divine – Jesus is Divine and Mary does nothing but point to the Divine. Today I was able to live the unity of Jesus and Mary in a particular way. I celebrated the Mass of Ash Wednesday at the altar of the chapel in the Most of the Holy Rosary, which houses the icon L’Advvocata of Mary. 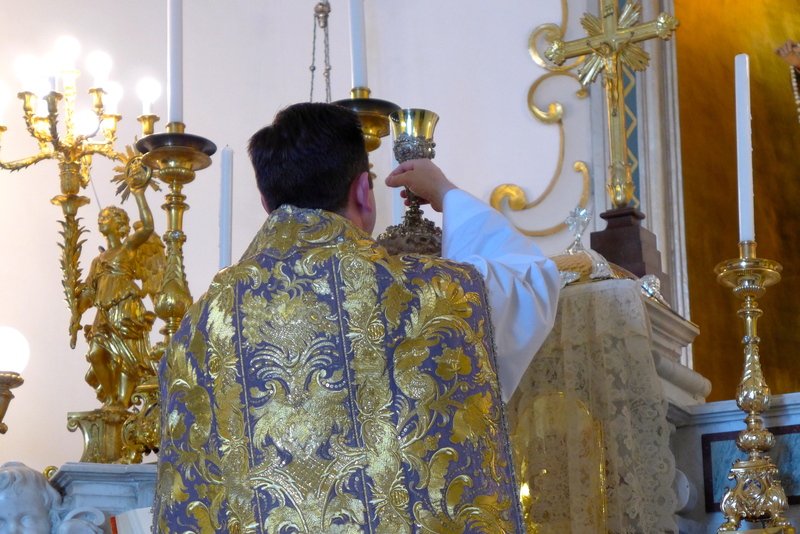 To raise the Sacred Host and Chalice is the greatest of act of glory that can be given to God. 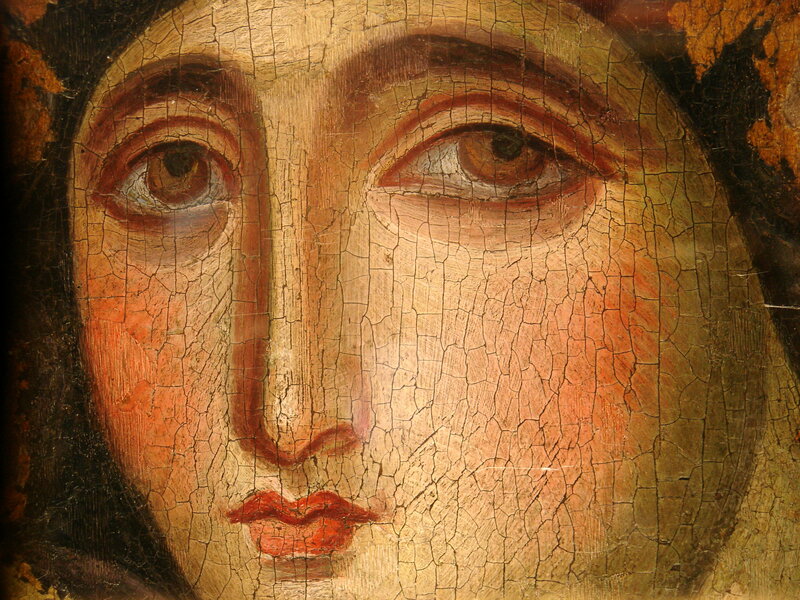 To look into the eyes of the Virgin Mary does nothing but nourish and magnify that glory in one’s heart. Look at her and she will have you look at Him. Do you have trouble with your resolutions? She will help. Is the fire of your faith cold, she will breathe on it – wherever she is the HOLY SPIRIT is right there too (Annunciation & Pentecost anyone?)! I am going to work to make these images (Jesus’ image at Manopello and Mary’s on Monte Mario) better known and better love because God used them once in history to renew Faith on the earth and He is going to do it again! ALL FOR JESUS, ALWAYS AND EVERYWHERE! All through Mary – look to her and soon you will be looking with her and glorifying God with all you have and are. A blessed Lent to all. I will be back in Madison in one week – a sad but joyful reality – I kindly ask for your prayers for safe travel and resolution to my health situation. I have always loved the Blessed Virgin Mary. Today, I fell in love with her. This morning my friend Fr. Daren and I met Mr. Paul Badde at a little cafe not far from St. Anne’s Gate at the Vatican. 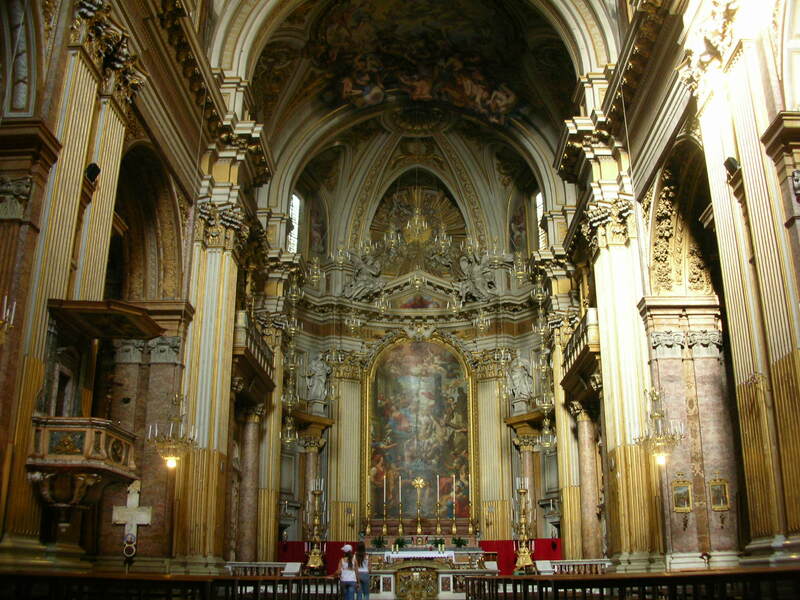 From there Mr. Badde took us to the Dominican Convent of the Holy Rosary on Mont Mario in Rome. Mont Mario is a hill in Rome, though not one of the Seven Hills of Rome. In ancient times it was outside of the city, located on the western side of the Tiber River and a bit north of the Vatican Hill. It is recognizable to many who have visited Rome as it is the tallest hill in Rome and there is an observatory on the hill which can be seen from most parts of the city. It is not often visited as there are many private homes and a beautiful nature preserve (which is not a normal Roman tourist destination.) It is also held that Mont Mario is the place where Constantine had his vision of the Cross in the sky before the Battle of the Milvian Bridge. The Convent of the Holy Rosary has ancient foundations but the current church is a baroque building build in 1725. The convent is home to an order of cloistered Dominican nuns – about 25 of them. While Mont Mario is not the original location of this particular convent, the convent was founded by St. Dominic himself when he came to Rome, about the year 1220. It is a beautiful place that, in addition to this wonderful contemplative order, houses significant relics of St. Dominic, St. Thomas Aquinas and St. Catherine of Siena. The icon is called in Greek Hagiosoritissa in Italian L’Avvocata or The Advocate. It is sometimes all called Our Lady of St. Luke. I have not had time to research this history very deeply as most of it seems to be in either Latin or Italian and is almost completely lost in English. In brief, it is a treasure. It is said to have been painted by St. Luke. 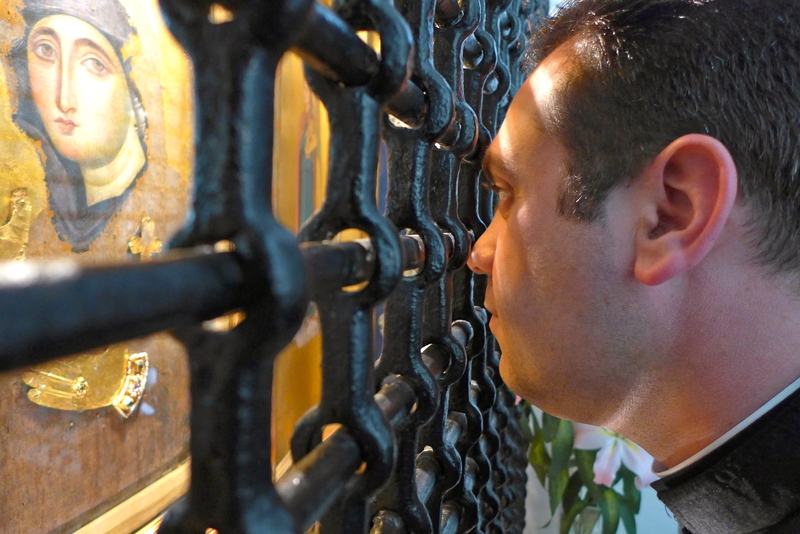 The first established Christian community outside of Jerusalem sent a request saying, more or less, ‘hey, you have the Apostles, you have the Virgin Mary, can we at lest get a picture or something?’ Thus, the first images of Jesus and Mary were sent to this place. When the Muslim conquests began they were sent to Constantinople. When Constantinople was first threatened, the image of Our Lady came to Rome and was entrusted to the Dominicans. That is the super short version. It carbon dates to the first century, so that claim is clear. There is an extant record of its being brought to Constantinople, so that is clear. There is also a record of Greek monks bringing it to Rome, so the line is clear. It is also a unique type of iconography. Many iconographers have come to see the image and have testified that the method used to make this icon is unique and has been lost to history. There is more historical detail but, it seems to have the clearest and strongest of all claims to be, if not the original icon of the Virgin Mary, an icon written by someone who knew Mary personally and looked upon her face. I looked upon that face today and didn’t want to leave. The eyes of this image pulled me in like nothing I have seen before and filled me with a consolation I have not felt. it was a window into endless beauty, pureness of love and joy beyond telling. More to the point, when I looked at and prayed before this icon of Mary, my heart was pulled to love the Eucharist in the Tabernacle like I had never done before. We prayed the Rosary before this image and all I could think was, ‘I don’t love Jesus enough but I can love Him more and more and more and more and more. . .’ It was a heavenly peace. In brief, wow! It is much like the image of Jesus at Manoppello (which I will write about soon.) How do more people not know about this! Pope Benedict XVI visited and venerated the image in 2010. If I was the Pope I would be up there once a week and have that icon in St. Peter’s for just about every Marian feast day there is and twice on Saturdays. It seems to me that the good God is re-unveiling some of this wondrous images and relics and working many miracles in a time when the world needs it so very much. St. Faustina is proved true when she talks about the Lord God working great miracles of the heart in these times. May He be blessed forever! As the West declines and the last lights of this once great civilization go off – a bright horizon opens by the work of the Holy Spirit to re-fire Divine Love in souls. True enough I hope to obtain a doctorate in Liturgy from the Pontifical Institute for Liturgy at the Pontifical Athaneum Sant’Anselm while I am in Rome. Just as much I hope to help spread the word about these great and holy icons (Manopello and Mont Mario) for I feel that, as He did in the early days of the Church, the good God wishes to use these things to bring people to know the wonder and glory of His Son, Jesus Christ. 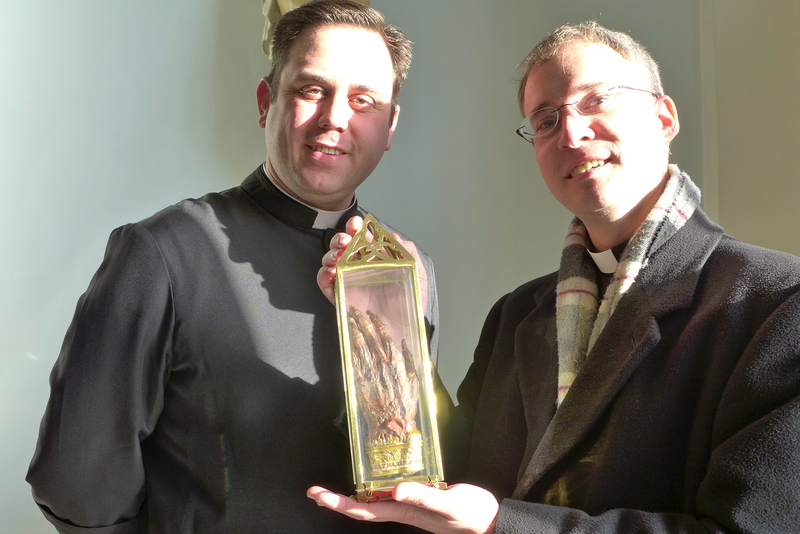 O, and they have the hand of St. Catherine of Siena. Lest the reader think me too dark or depressive, feel free to read this post as a counterweight to ‘Felix Roma Part 2.’ I do not change anything said in that post but wish, in this post, to let people know some of the things that Christians have brought to counterweight the immense evil that is at the foundation of this city. As you may know, to save the world God sent His only begotten Son who is the visible image of the invisible God. The radical nature of the Incarnation of Jesus Christ is one of, if not the most, shocking and beautiful aspects of the Christian Faith. It is beyond conception that the utterly transcendent God will incarnate in a human nature to show His Face to the world, leave His commands and bring salvation to the world from the inside out thus redeeming all and making all beautiful. By His Divine Will and through human cooperation icons of this salvation have been left all over the world. 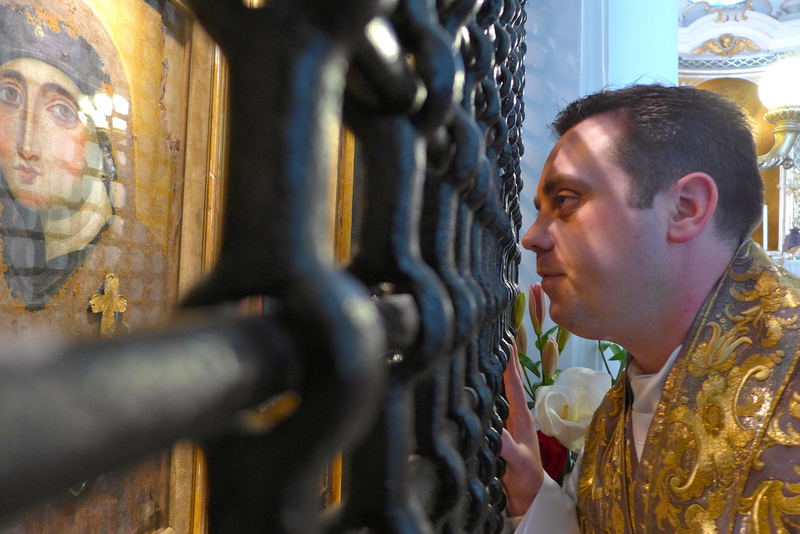 The Sacraments of the Church are the first and most important of those things. 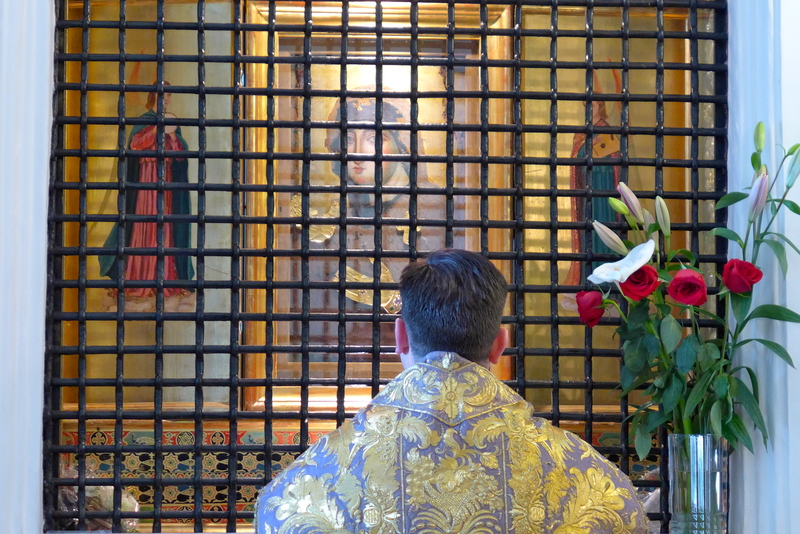 Holiness of life is the next of those important icons. From these things a whole treasure of Christian holiness, art, architecture, music, poetry, literature – in short, culture – has arisen. In no place is this more evident than in Rome. Let’s take saints for one: no, we can’t know these things for certain until either canonization or Eternity, but there are SO many bishops, priests, deacons, religious, seminarians and lay people living and working towards a life of holiness that I am truly amazed. Indeed, I have met many people striving for holiness whenever I have been but here in Rome it is truly edifying. The house I live in, the Casa Santa Maria, would be prime example of that. Such a gathering of orthodox, hard-working, smart, prayerful, humble and good humored men would be hard to find anywhere else. This reality is replicated all over the city and is truly edifying. Let’s turn to relics of Saints – after Sacraments and Scripture – these are the greatest inspirations and helps to holiness. First the princes – St. Peter and St. Paul have their mortal remains resting in the greatest shrines in the Christian world. Let’s see, who else? (Really some relic of all the Apostles are in this city), St. Gregory the Great, St. Leo the Great, St. Basil, St. Gregory Nazianzen, St. Pius V, St. Pius X, St. John Paul II, St. Josephat, St. Ignatius of Loyola, St. Francis Xavier, St. Aloysius, St. Catherine of Siena, St. Monica, St. Josemaria, St. Agnes, St. Cecelia – and these are just the ones I saw this week. The relics of Cross of Christ, the tip of the spear that pierced His side, the Crib from Bethlehem, the Stairs from the praetorian in Jerusalem, the table used at the Last Supper, chains the St. Peter wore while imprisoned, the house where St. Paul lived while in Rome, the oldest known image of the Virgin Mary, and the list could go on. Art? Let’s leave out all the ancient frescoes and mosaics whose creators we don’t know. We still have Michelangelo, Rafael, Bramante, Maduro, Botticelli, Caravaggio, Bernini. This is really a lame attempt as I am only listing things that come up as I write. Let me just list some of the simple things in my neighbor hood to illustrate. Out the back door in the Basilica of the Twelve Apostles. Not only is it beautiful and contains much moving devotional art, it houses the relics of the Apostles Simon and James the Less. Not bad. It also houses the relics of some early martyrs. One block away out the front door is the Trevi Fountain. Not a holy site but man is it beautiful, especially at night. 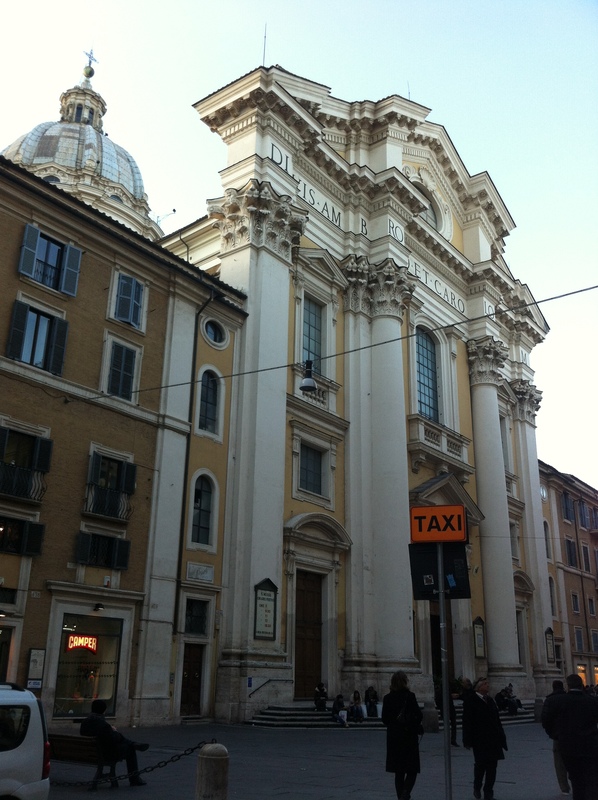 A five minute walk out the back door, on the famous Via del Corso is the church of Santa Maria in Via Lata. 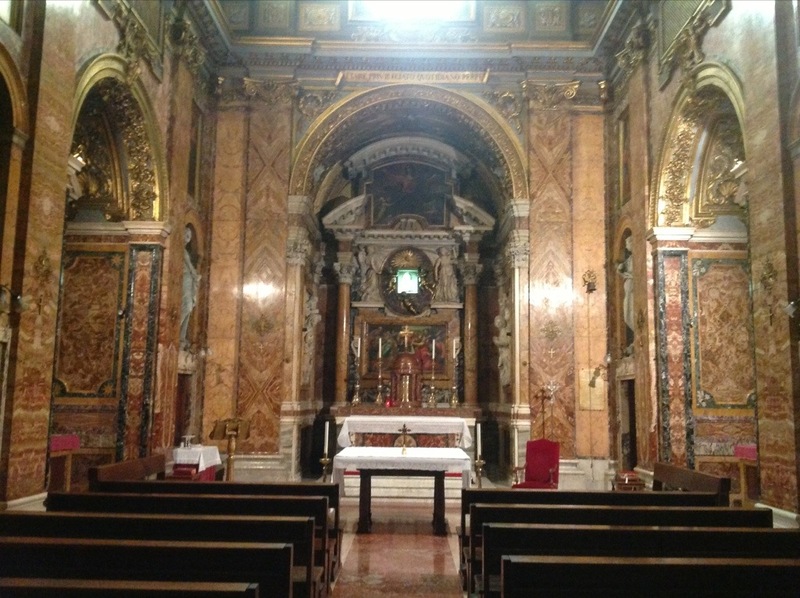 Not only does this place house a beautiful and very ancient image of our Lady, it has Eucharistic Adoration every night from 5:00 pm – 10:00 pm, does and amazing apostolate for the poor in downtown Rome, it also happens to be built on top of the house where St. Paul lived during his house arrest in Rome. St. Luke also lived there for a time. 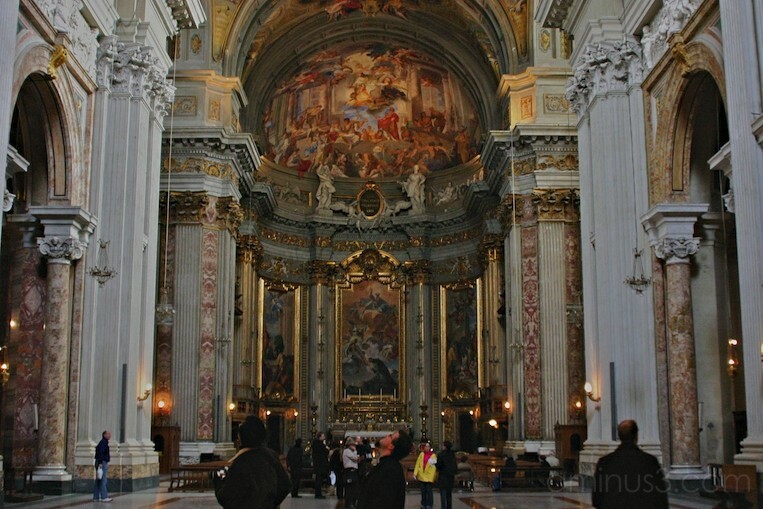 About a 10 minute walk from the Casa is the Basilica of Sant’Iganzio. 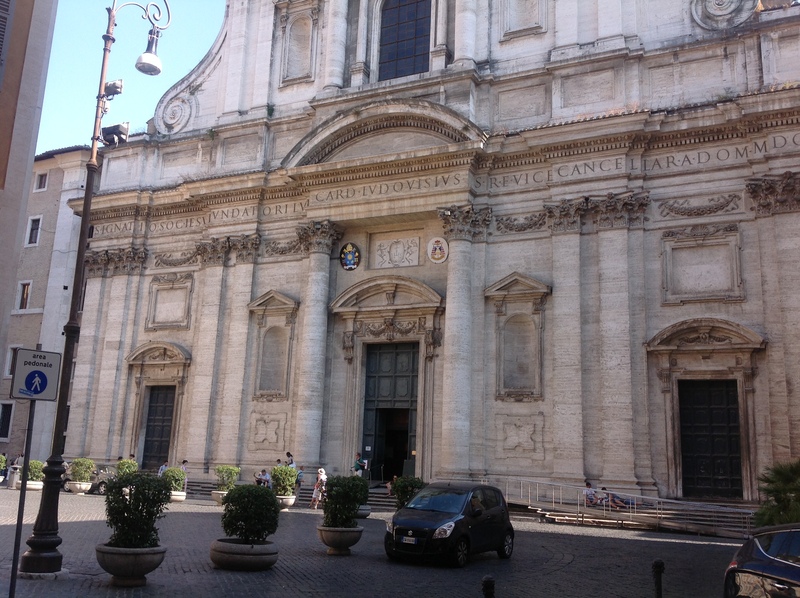 Oddly enough St. Ignatius is not buried here. 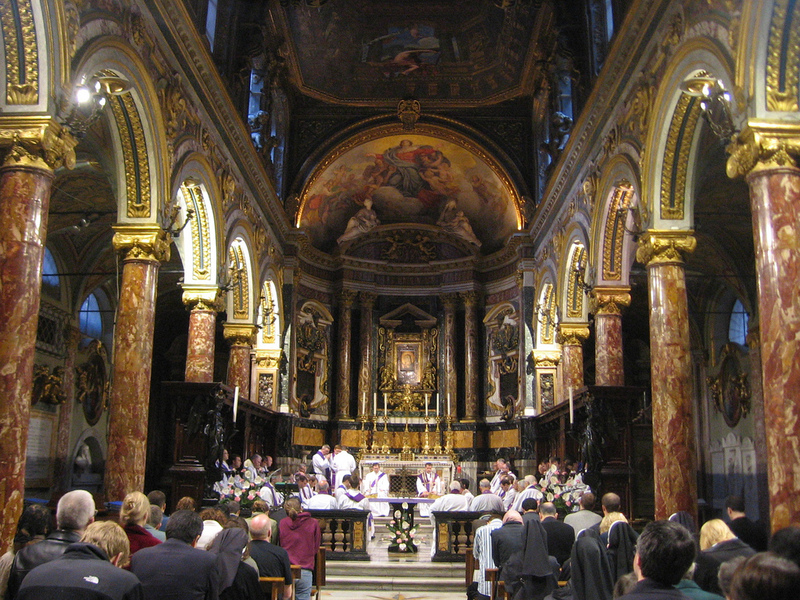 But you can venerate the tombs of St. Aloysius or St. John Berchmanns, or, if that’s not enough, St. Robert Bellarmine. Oh, the ceiling is both beautiful and a giant leap forward in the history of art. The church of Sts. 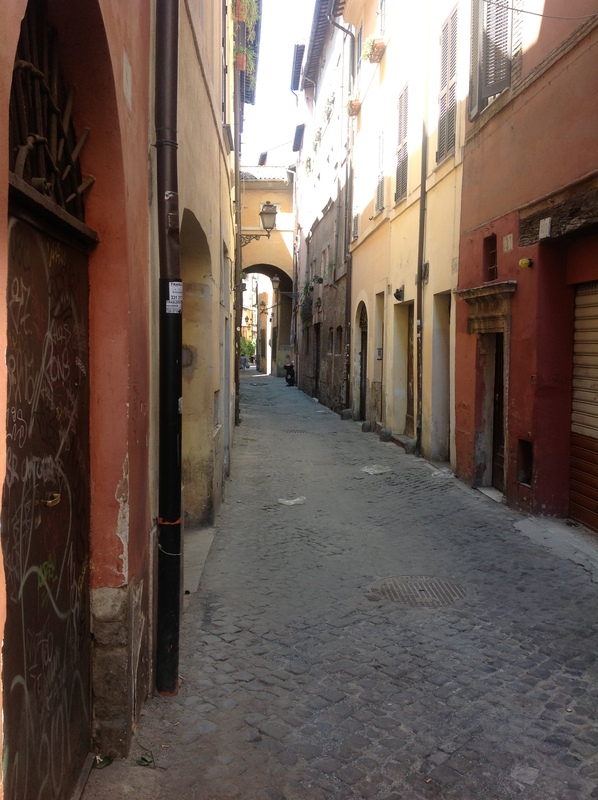 Charles and Ambrose is not ‘in my neighborhood’ but is only a 15 minute walk down the beautiful Via del Corso, heading to the very beautiful Piazza del Populo. Also, I visited there today to do my mental prayer and pray Vespers. 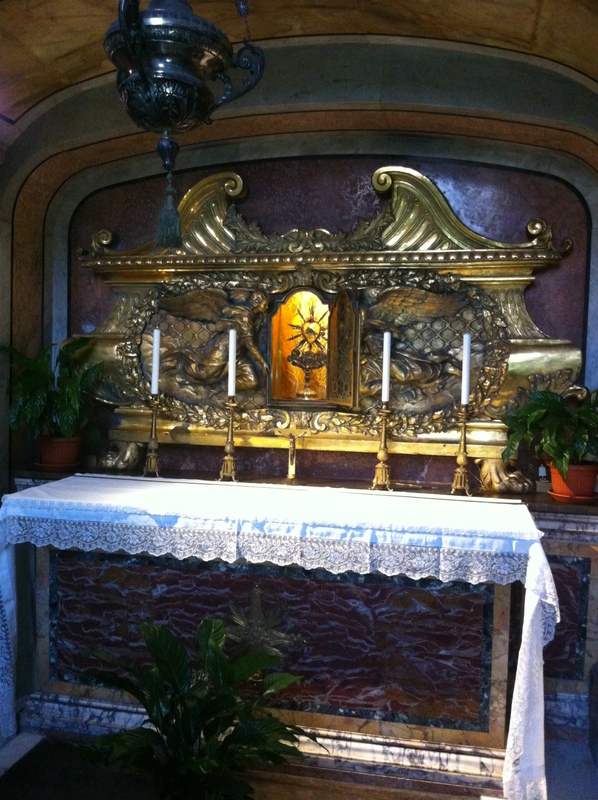 Oh – and the heart of St. Charles Borromeo is there. All this and more is in this city because Peter shed his blood here, Paul preached here, martyrs died for the Faith here, Saints lived for Jesus here, Popes governed for the good of the world from here, artists sacrificed their gifts for God here. God has placed such unique goodness in this city for two millenia and it is far from over. What I have listed above is only a small part of the glorious things in this city. It is a privilege to live here and I hope to honor it with my work. 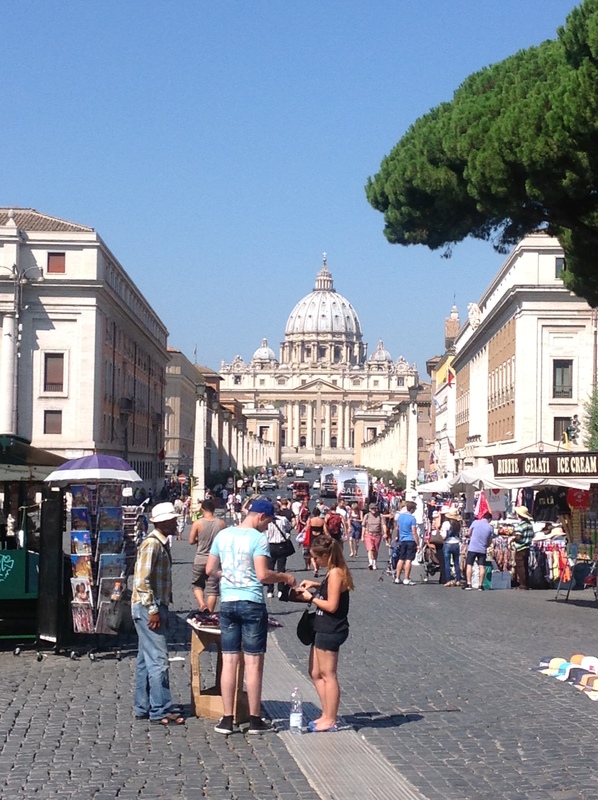 Felix Roma Part 1 – Rome Sweet Home? True enough, it has been a while since I have written. I made a resolution that I would not write on the blog during the first semester of my studies in order to get my schedule in order. Now, the semester is over and I hope to write during this week of break and also post once a week, on Wednesdays, during the coming semester. Some of you know that I have moved from the little city of Madison, WI, USA to the great Eternal City of Rome. Some people would call it Rome, Italy but that is a little farce put on in order to fit this city into the contemporary structure of modern Europe. True enough, Rome is on the Italian Peninsula but it would be a grand mistake to place this city in the minimalist structures of mere geography. The ancient Empire has drawn the nations into itself. It speaks every language and holds every culture. 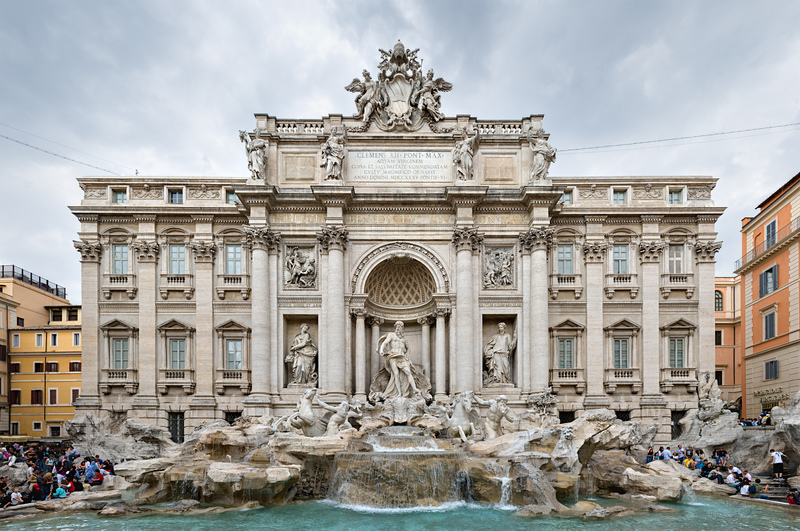 A number of titanic fools like Garibaldi and Victor Emmanuel had the hubris to reduce this city to the capital of Italy – a farce of a nation and cruel joke to all who live here. 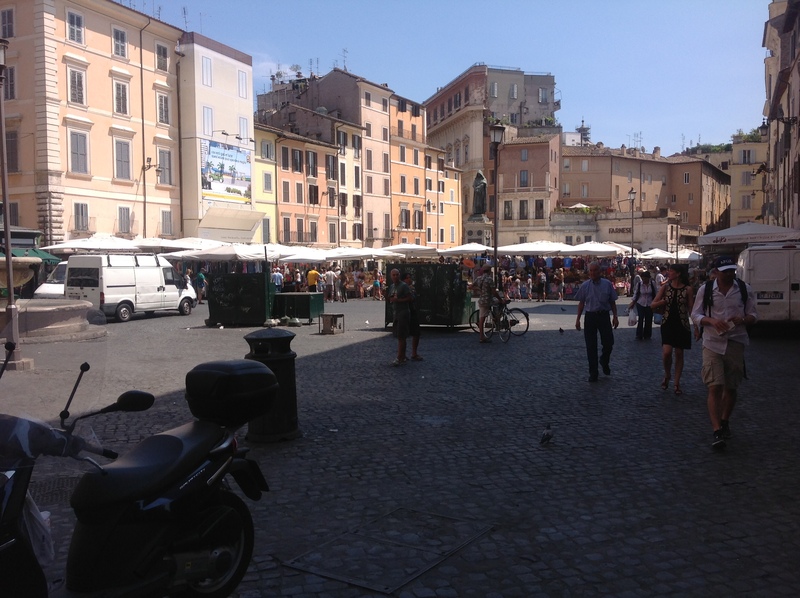 This is where I live – Rome. Officially I reside at the Casa Santa Maria. 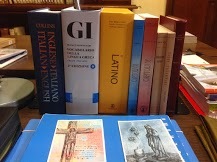 The Casa part of the Pontifical North American College – NAC for short. 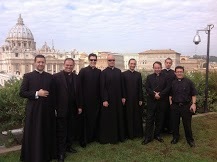 Now, when most people hear ‘NAC’ they either think nothing or they think the seminary built near the Vatican. Fair enough. Technically speaking the NAC consists of the Casa Santa Maria, the Seminary and the Casa O’Toole. The NAC is owned by the Unites States Conference of Catholic Bishops and governed by a Board of Directors. 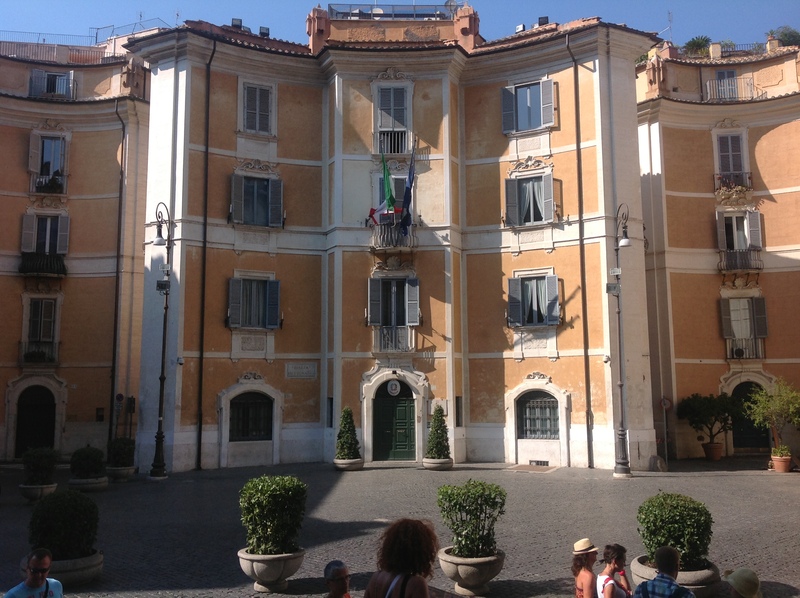 The Casa Santa Maria is the house for American priests in graduate studies in Rome. This is where I and 70 other priests live. 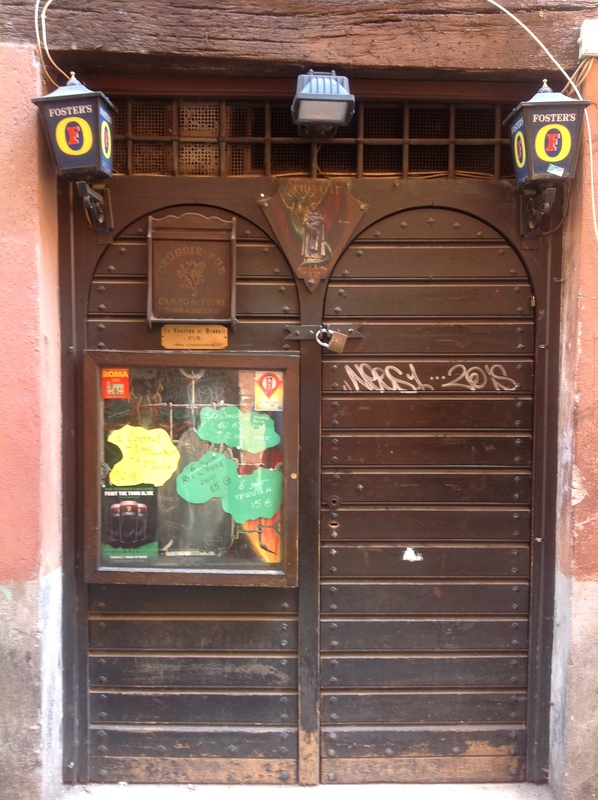 The Casa is found at Via dell’Umilta 30 in Rome, one block away from the Trevi Fountain, three blocks away from the Pantheon and right next door to the Basilica of the Twelve Apostles, where the relics of Sts. Simon and James the Less are buried. Every morning I wake up at 4:30 am, get cleaned up, say Mass in our beautiful chapel, make my holy hour, eat breakfast and then take the bus to school. On the way to school I pass by the house where St. Paul lived when he was under house arrest in Rome, the Piazza Venezia, the Roman Forum, the Colesseum, the Palatine Hill and the Circus Maximus. 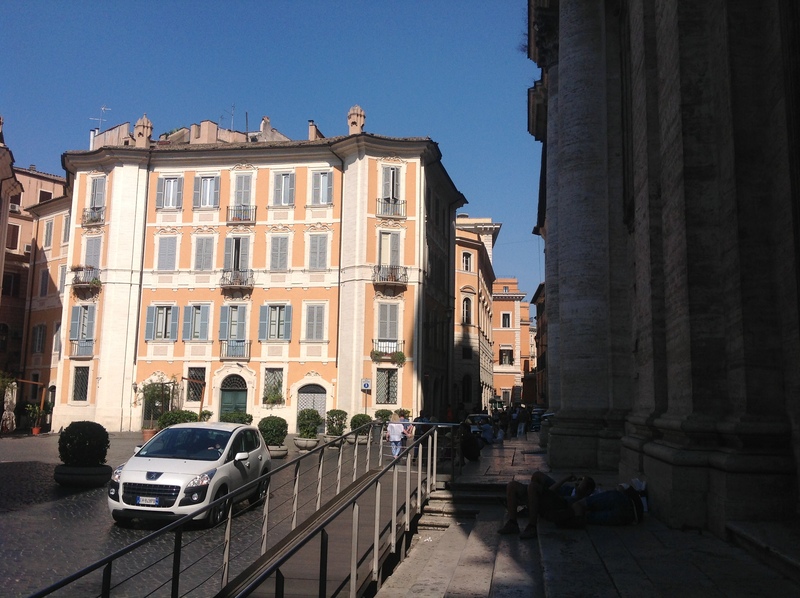 The bus stops at the base of the Aventine Hill and I walk up the old neighborhood of the Roman senators and patricians which is now a very beautiful and quiet place that is home to many embassies, fine hotels and fairly wealthy Roman residents. After morning class I walk home down the Tiber river past many beautiful, though less historic, things. Lunch is at 1:00 pm after which I make some devotions and then do homework for a bit. I exercise for a hour in the mid-afternoon and resume study when I am cleaned up – this really helps falling asleep during language drills. I do my evening prayers at 6:00 pm and have dinner at 7:00 pm. After dinner is time to email, check news, write on the blog, Skype, read – try to act like a normal person. On Thursday evenings I head up the the Seminary, on Friday evenings I have my Circle and the weekends are various depending. This is my life. This is how I live it and where I live it. I live in Rome. To be sure, Rome is NOT home and never will be. I am squarely and American and clearly a son of Wisconsin and love no place on earth better than in front of my parents little house in my little hometown in the middle of nowhere that anyone cares about. Nothing will ever change that. I love home with all my heart and I miss my family and my friends more than I can say – I love you all and always will. But I live in Rome. I don’t live in Madison or Waunakee or Prairie du Sac, I live in Rome. I don’t live in Italy (I will explain that later also) I live in Rome. I did not choose this, I don’t really understand it but I love it. I also hate it. You can’t love Rome if you don’t hate it. This is a city at war with its very self and has been ever since the Blood of the Savior came to and conquer the evil of the empire. Rome’s masters and lords are long dead and the empire they ruled has been divided up among many lesser lords. There are no Romans, no such person exists anymore. O, there are people who live in Rome, people who were born and raised in Rome, but there are no more Romans. Too many Goths and Visigoths and French and Austrians and Tuscans and Sardinians and Germans and Americans have come through and raped and pillaged and conquered. 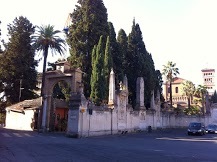 There are many crumbly bits and dead monuments to Imperial Rome and the ancient Romans. 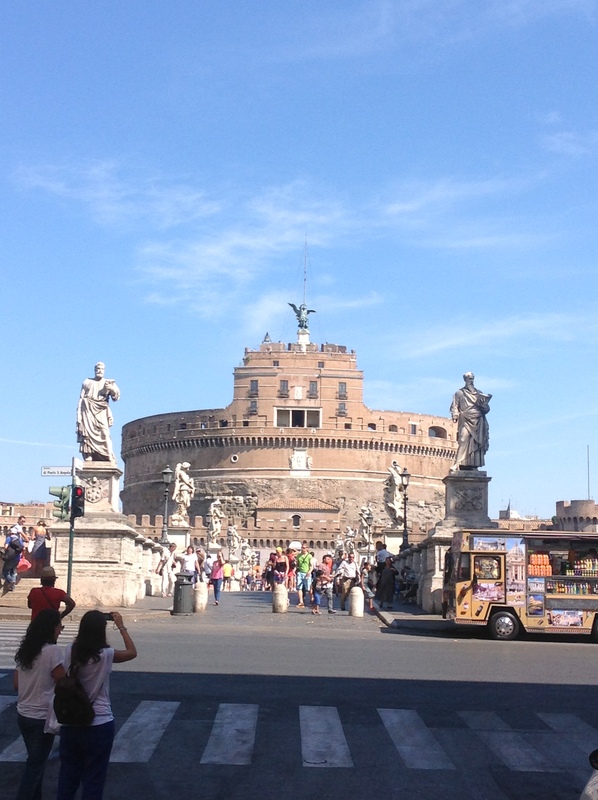 There is even a gaudy monument to a pretender Rome and fake Romans. But not the real thing. It is an insane city, governed by a corrupt and inept political class and inhabited by people who simply don’t care, so long as the tourists (be they the powerful or the ordinary) come and spend their money and stay out of certain restaurants. This makes for an insane city where the amazing is simple but the ordinary is nearly impossible and so, if you don’t hate Rome it means you know nothing about Rome and only pay attention to the glitter and the sugar. 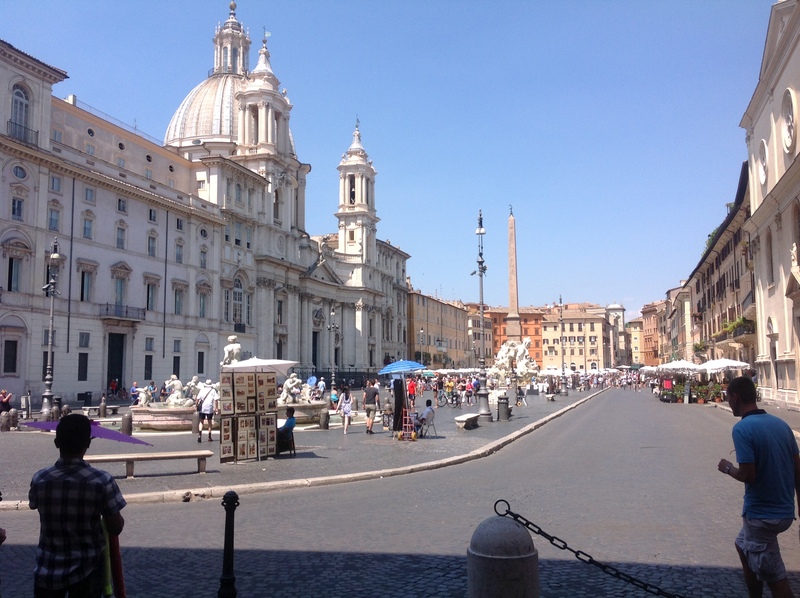 If you don’t love Rome it means you do not love Rome nor do you know anything about her for she is home to such wonders of the sanctity and theology and philosophy and art and architecture and music and history and wonder and awe. This is where I live. I am so immensely privileged and wouldn’t wish this on anyone. I love it hear and never want to leave but I also hate it hear and cannot wait to get out. More to come, if you care to read it.